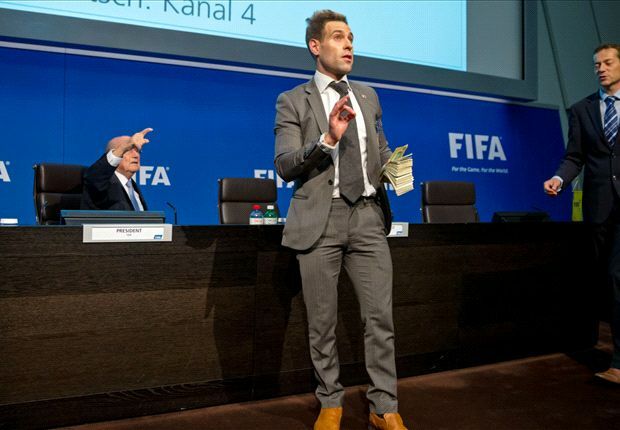 A British comedian interrupted a Fifa press conference on Monday and threw fake bank notes at outgoing president Sepp Blatter. The man has been identified as television broadcaster Simon Brodkin, who is renowned for his publicity stunts, having most recently crashed rapper Kanye West’s set at the Glastonbury music festival. Responding to the incident when the conference eventually started, Blatter said: “I’m sorry what just happened. This has nothing to do with football. The Swiss was speaking after it was confirmed that a vote will be held on February 26 to decide his successor. Blatter secured another term as president at an election in Zurich last month but he subsequently decided to stand down after feeling that he had lost the support of many within the football world in the wake of the corruption scandal that has rocked Fifa. Fourteen people have been arrested as part of an FBI-led investigation into allegations of bribery dating back to 1991. In addition, Swiss authorities have launched a separate inquiry into the votes that saw Russia and Qatar awarded the rights to host the next two World Cups. Blatter, who has been at the helm of Fifa since 1998, has not been accused of any wrongdoing in either case yet he has faced severe public criticism over his running of the game’s governing body. Brodkin, meanwhile, is well known to British football fans for one of his characters, ‘Jason Bent’, who is a parody of the average Premier League footballer.